Hello, friends today I’m going to share an article with you for the iPhone, iPad, and iPod devices users.Today we’re gonna discuss the DFU Mode or Device Firmware Update Mode for iPhone, iPad, and iPod users when their devices are not working properly.DFU Mode in iPhone is that state when your iPhone or iPad’s is powered on but hasn’t booted or your iPhone showing you a Back Screen.DFU Mode basically used when you want to jailbreak, un-jailbreak or update your expire beta software but unable to do that, then Apple has a solution to put your iPhone, iPad or iPod Devices into DFU mode can be your last hope.Now you might be thinking that DFU Mode is the only option to solve problems, but DFU mode is not the only option to solve iPhone, iPad or iPod isn’t working issues they’re 2 more terms that you may encounter with your iPhone’ modes.Apple also has Recovery Mode and Safe Mode to fix your iPhone isn’t working properly problem. In recovery mode, your device will reset and get back to its original or default state.Recovery mode makes the interface between iTunes and your iPhone, iPod or iPad.It wipes out all data and restores your setting, so make the backup of your phone/ device before putting your device into recovery mode or otherwise, all data will be lost of your device.Now discuss the safe mode, Safe Mode is that mode in which you can access your iPhone few areas and remove the running corrupted process.Same as the iPhone, Windows or MacOS also has the safe mode option to make some change on your devices that not being able to do in normal mode. Now you get understood about recovery mode and safe mode, but if you are not able to slove your iPhone device problem, then DFU mode is only last option for you to solve your iPhone problem.Because DFU Mode is one of the most effective function you can perform when your iPhone perform any kind of certain problem.Also, DFU mode is very easy and very handy if you perform any other task like jailbreak, un-jailbreak or recover your device when other two modes aren’t working.And DFU mode also allows you to recover your device in any state as compared to other two modes. Now let’s talk about the DFU Mode. 1 What is DFU Mode? Like I have said before DFU Mode(Device Firmware Update Mode) is a mode in which you can fix your iPhone various type of issues like iPhone won’t charge or you can jailbreak or un-jailbreak your iPhone and you can make some change or modification on your iPhone iOS version you’re running.In this mode, you should first connect your device to your PC or Mac and run iTunes on your system to interface with your device while it not yet booted up but powered on and showing a black screen without the apple logo. Step 1:- Initially you will need to install iTunes on your PC or Mac, So first check whether it is installed on your computer or not, if not then download from here. Step 2:-After the installation of the iTunes, Run iTunes, Plug your iPhone with the help of lighting cable to your PC or Mac. 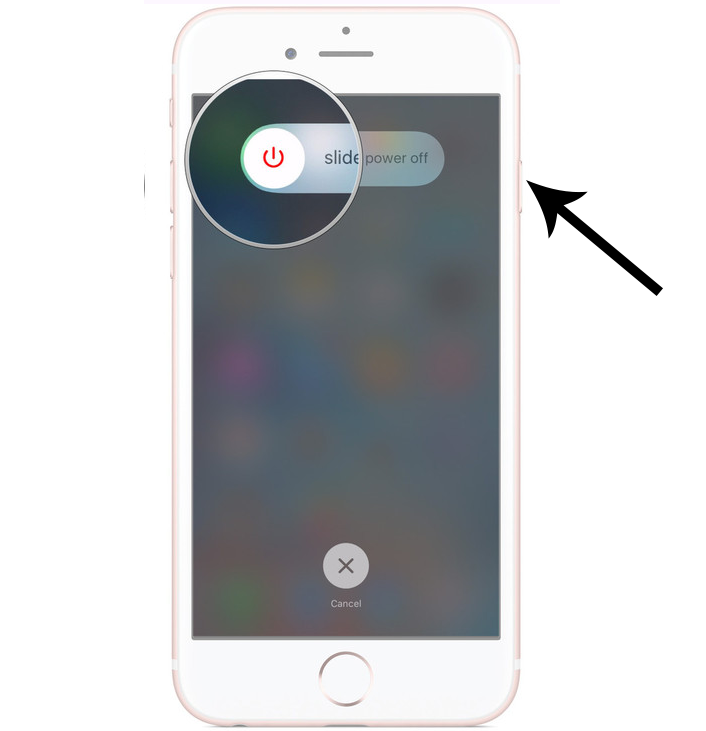 Step 3:-Now shut down your iPhone by pressing and hold down the ON/OFF button on the right side.And swipe slider to power off from left to right. Step 4:-After the device is power off, press and hold Power and Home button in together for the 8 second for iPhone 6 s and old as shown in the image. Step 5:-Now after the 8 second, release your finger from Power Button but do release from the Home Button and keep holding the Home Button it until shows you a message “iTunes has detected an iPhone in recovery mode”.Now you must restore your iPhone before it can be used with iTunes. Step 6:-After this release the power button, now you see that your iPhone showing fully black screen without the apple logo.Now it means that you have successfully entered in the DFU mode. Step 4:-After the device is power off, press and hold Power and Volume down button in together for the 8 second for iPhone 7 and newer as shown in the image. Step 5:-Now after the 8 second, release your finger from Power Button but do release from the Volume down button and keep holding the Volume down button it until shows you a message “iTunes has detected an iPhone in recovery mode”.Now you must restore your iPhone before it can be used with iTunes. Step 6:-After this release the Volume down button, now you see that your iPhone showing fully black screen without the apple logo.Now it means that you have successfully entered in the DFU mode.And if your iPhone is not showing the black screen then try again the Step 4,5 and also check is iTunes work properly on your pc or Mac.After you do all the step successfully and entered into DFU mode then see your device working properly or not. It is very simple you just have to do, just holding down the sleep or power button until the slider appears and move the slider.And if you hold the sleep or power button and home or volume down button for longer, the device turns off the screen and goes dark. So you have successfully put your iPhone into DFU mode but those who are not able to do this or afraid of putting their iPhone into DFU mode, don’t worry you just have to repeat some step to put successfully your iPhone into DFU mode.I hope after executing all the step properly you easily put your iPhone into DFU Mode and also this tutorial clear all of your confusion about the DFU Mode.So if this tutorial helps you to understand DFU Mode and make easy to put your iPhone into DFU Mode So, please don’t forget to share this tutorial with your friend if they also want to put their iPhone into DFU Mode. © KCGeek 2017 - 2019 | All Rights Reserved.